Hampton Sides’ latest book is “not to be missed,” said James Scott in the Charleston, S.C., Post and Courier. 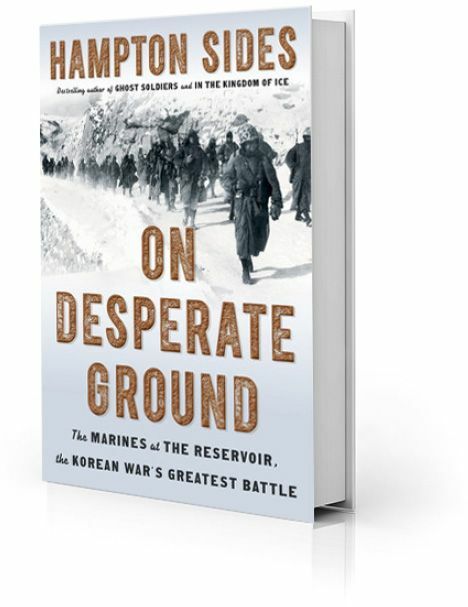 A “heart-stopping” account of a legendary Korean War battle, On Desperate Ground “will appeal to far more than just military readers.” Sides, the best-selling author of Ghost Soldiers and In the Kingdom of Ice, is one of this era’s best nonfiction writers, and he’s made the story of the Battle of Chosin Reservoir new again by weaving in the memories of four dozen American survivors he interviewed. Sides “sets the scene well,” said Mark Yost in The Wall Street Journal. Three months after North Korean troops overran South Korea in June 1950, United Nations forces landed at Inchon in a surprise move that allowed the Americans and their allies to seize Seoul. Gen. Douglas MacArthur, commander of the effort, pushed for a quick rout of the North Koreans. But he dismissed reports that Chinese forces had crossed into Korea ready to join the fray, so when he ordered U.N. troops to rush north through the mountains toward Pyongyang, he was sending them into not just brutal cold but also a trap. At Chosin Reservoir, the roughly 30,000 U.N. troops—about half of them U.S. Marines—were beset by 150,000 Chinese soldiers, and Sides “does some of his best work recounting the combat.” The rival forces both suffered heavy casualties over the following two weeks, and while many fighters froze to death, others survived because the subzero temperatures instantly cauterized their wounds.